There is no information on the EzBit2u website indicating who owns or runs the business. The EzBit2u website domain (“ezbit2u.com”) was registered on the 20th of September 2016. Manisegaran Karuppiah (right) of “Grassroots Online Biz” is listed as the owner, with an address in Johor, Malaysia also provided. Prior to launching EzBit2u, Karuppiah was an affiliate with Four Corners Alliance Group, Brain Abundance and FutureNet. 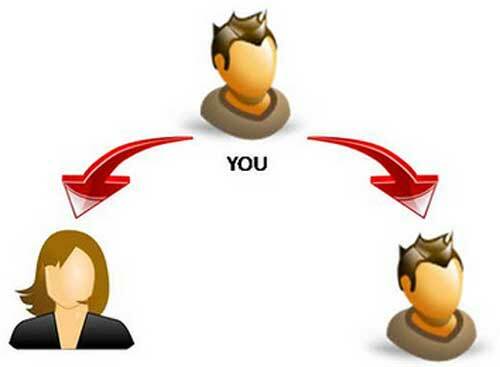 Read on for a full review of the EzBit2u MLM opportunity. EZBit2u has no retailable products or services, with affiliates only able to market EzBit2u affiliate membership itself. The EzBit2u compensation plan sees affiliates purchase 0.001 BTC positions in a twenty-five tier 2×1 matrix cycler. A 2×1 matrix places an affiliate at the top of a matrix, with two positions under them. The two positions are filled when subsequent positions in the cycler are purchased. Once both positions are filled the affiliate’s position “cycles” out of the matrix and enters the next tier of the cycler. EzBit2u affiliate membership is free, however affiliates must purchase at least one 0.001 BTC matrix position to participate in the attached income opportunity. The EzBit2u website advertises it can “turn 0.001 BTC into 2000 BTC”. Unfortunately with nothing being sold or marketed to retail customers, all EzBit2u dos is shuffle newly invested funds to pay off existing investors. This makes it a Ponzi scheme. EzBit2u’s financial fraud is achieved through a twenty-five tier matrix cycler. The cycler requires an ever-increasing number of position purchases to pay the few positions that cycle to the upper cycler tiers. It goes without saying that those positions belong to Manisegaran Karuppiah, with most EzBit2u affiliates otherwise taking a loss. As with all Ponzi schemes, once recruitment of new affiliates drops off EzBit2u will be starved of funds and collapse. In addition to owning the pre-loaded positions that cycle first, upon collapse Karuppiah also keeps funds attached to positions that haven’t reached Tier 4. The use of bitcoin by EzBit2u also means that recovery efforts upon collapse will be next to impossible. Yo: "Founders of… Enriching a serial scammer scam them into being founding members of..."
brian ski: "When are these hair lipped yokels who made idiots of themselves defending Ash..."
brian ski: "Not a surprise whatsoever but I expected a more novel excuse. Had this scumbag Ash..."